I thought I would kick off Easter week with a peeksie around my digs. 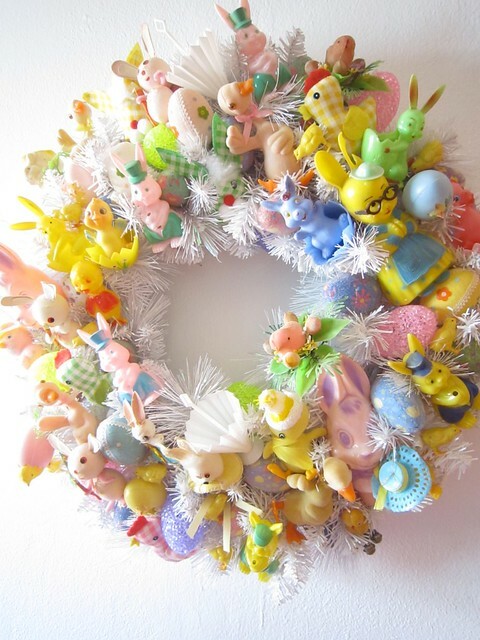 I have acquired a few new bunnies since last year, but my most prized possession is a new Easter wreath. If you thought the Christmas wreaths my mother makes were fabulous feast your eyes on this bad boy. Did I mention that it lights up. Oh ya it does. It’s hard to pick a favorite part of the wreath, but I gotta say I’m leaning towards the bunny in bifocals. Was she having troubles finding her carrots, why does she need glasses? 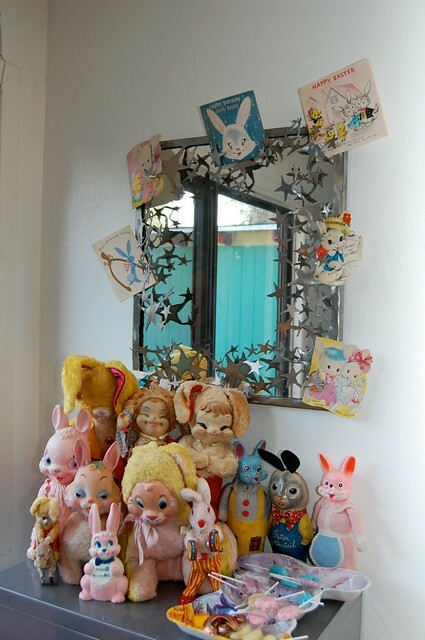 Every time we sit down at the kitchen table we have my bunny collection smiling at us. Well ok we don’t eat at the kitchen table very often these days (I have a newborn give me a break). More bunnies and a few chicks sit atop the bar in my game room. I like the irony of the chipper chicks & crew hanging out at the bar – booze and bunnies. Lastly I realized there is a little bunny that hangs above my kitchen sink to remind me of Easter all year long. 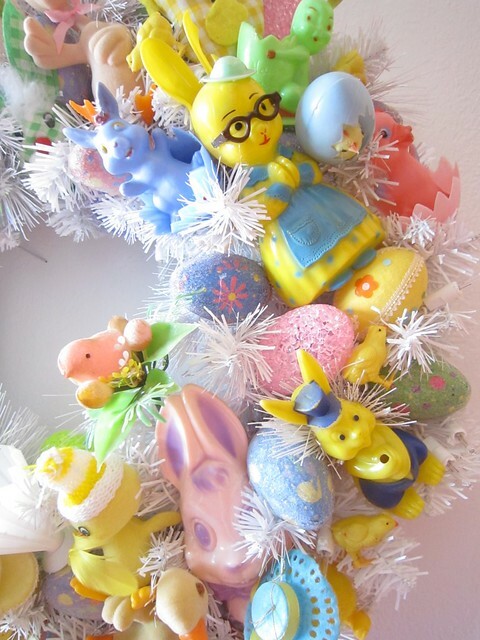 Did you do any Easter decorating this year? 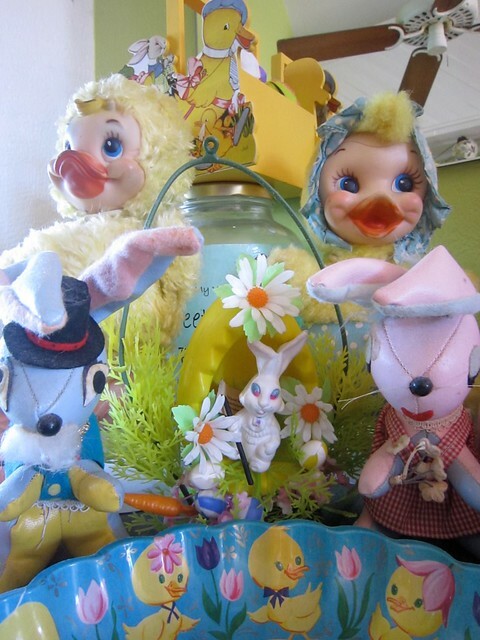 Posted April 18, 2011 & filed under Easter, Home Decorating. Is it possible to have too many. Oddly several of them were already displayed around my house year round and then last year it dawned on me to gather all the bunnies up for an Easter display. I love the bunny with glasses, too (gee, I wonder why? 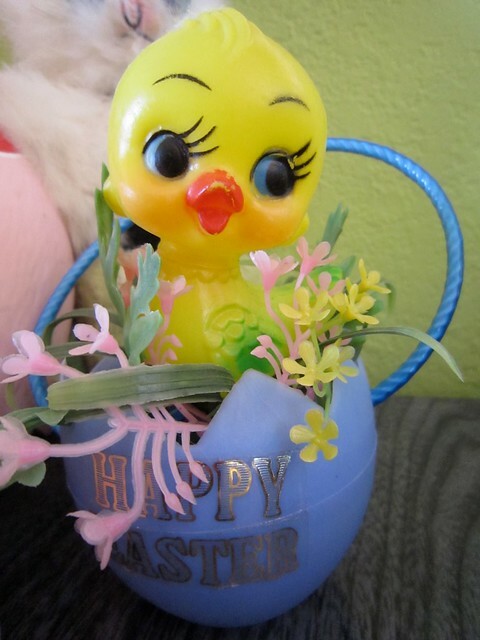 ), but I <3<3<3 the long-lashed duckie (chick?) in the egg! Sooo cute! Oh WOW !!!! I love that wreath!!!! Your mom is so clever…the apple never falls far from the tree! I have the plastic bunny girl with glasses in pink! !…and I have that little blue ducky bowl…..I gotta get to postin' my decor…or actually re-arranging…don't like what I have done just yet!! I lerve my new wreath too. My dream is to have a Halloween one as well. The problem is that most holidays besides Christmas have very few trinkets and when you do find them they are crazy expensive. I gotta say I was not totally happy with my arrangement of bunnies this year. I had to throw it up in a hurry between feeding the baby and toddler naps. 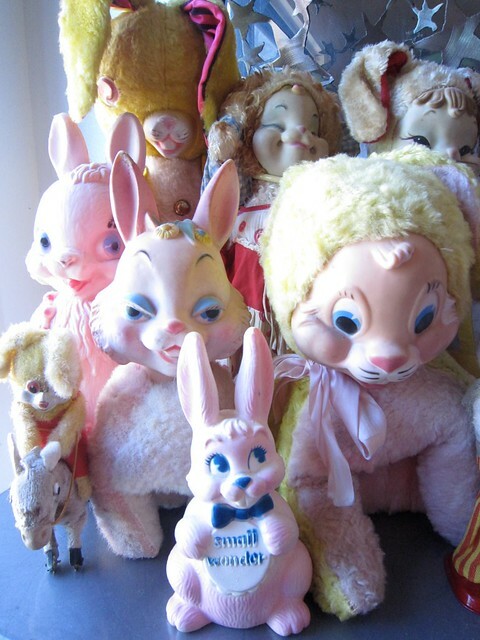 Wow your bunny collection is creepy awesome. Love them. And, I think I have the same round scalloped plastic Easter dish (it had a woolworth's tag on it when I found it at Goodwill). I think I paid 50 cents. Steal! I love the wreath, it reminds me of a Christmas wreath I made for myself covered in green doodads, beads, toys, etc. 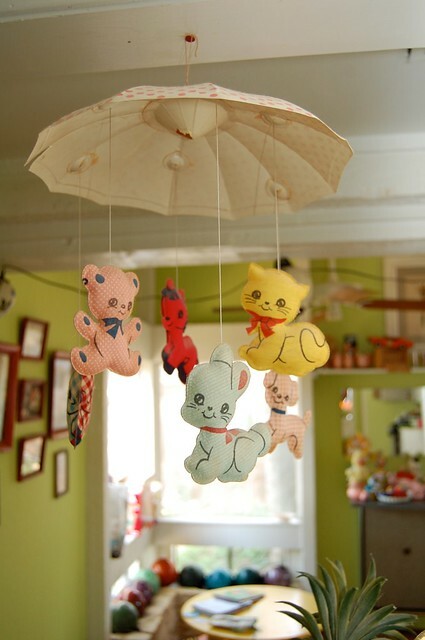 I'm going to have to start acquiring easter doodads.